The Event Log notification is a mechanism by which one or more users may receive email notices when certain events occur. The Windows Event Log can be set up to provide notifications of certain DataKeeper events that get logged. *Note: This option is only available for Windows Server 2008 R2. Open Event Viewer, go to the System or Application log and highlight the event in which you want to be notified. 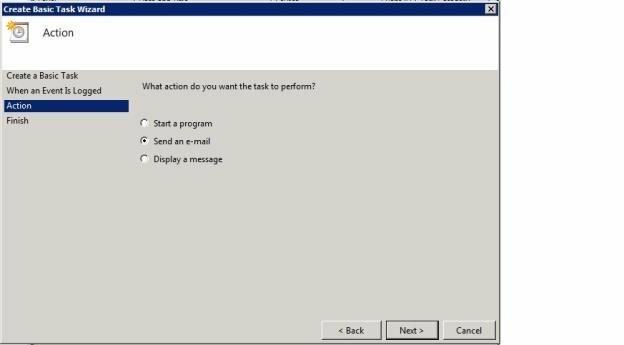 Follow the Task Wizard directions, choosing the Send an e-mail option when prompted and filling in the appropriate information. When you click Finish at the end of the Task Wizard, the new task will be created and added to your Windows schedule. *Note: These email tasks will need to be set up on each node that will generate email notification.